What a difference a couple of days makes. Late last week, the Murdoch Times published a leader entitled “True Frit”, telling Young Dave he should join the TV Debates. The next day, the paper had completed a U-Turn and was now telling “Sheer Arrogance … in the debate on the debates, the broadcasters have gone too far”. Now, right across Creepy Uncle Rupe’s empire, everyone has agreed that TV Debates are A Very Bad Thing Indeed. 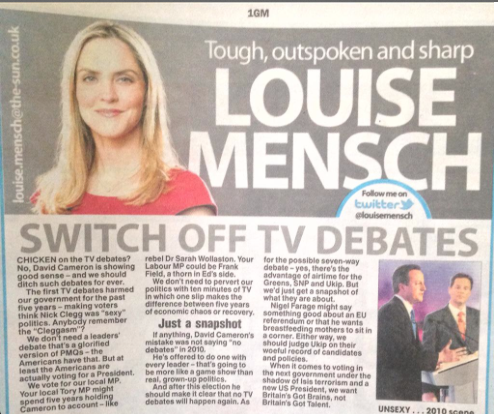 That, inevitably, brings us to yet another spectacular U-Turn, this time by (thankfully) former Tory MP Louise Mensch, now representing the distant constituency of Manhattan Upmarket, whose column in Sunday’s Sun is unequivocally titled “Switch Off TV Debates”. She goes on “Chicken on the TV debates? No, David Cameron is showing good sense - and we should ditch such debates for ever”. And there’s more - much more. “The first TV debates harmed our Government for the past five years”. As they happened before the election, that would be an interesting idea (and see what she said at the time below). “We don’t need a leader’s debate that’s a glorified version of PMQs” she continues, seemingly oblivious of what Young Dave told Pa Broon in 2008: “I have to say to the Prime Minister that if he really thinks that these exchanges once a week are a substitute for a proper television debate, then he is even more out of touch than I thought”. 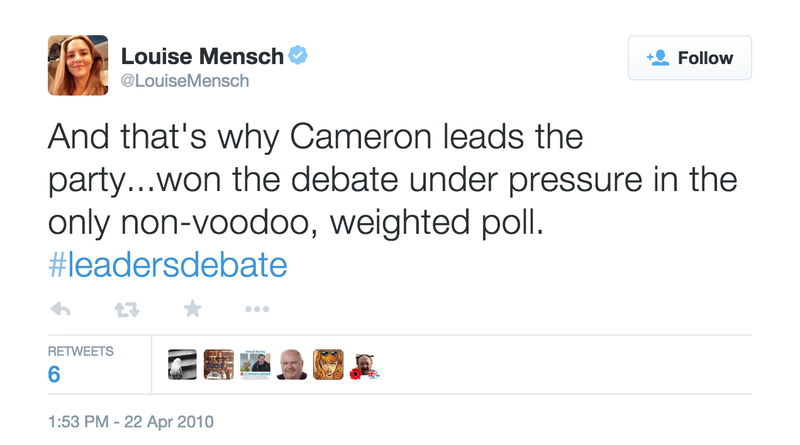 But Ms Mensch is sure of her ground: “If anything, David Cameron’s mistake was not saying ‘no debates’ in 2010 … after this election he should make it clear that no TV debates will happen again”. In fact, what Dave did say was “I’ve always wanted these debates to happen. I mean they happen in every country. They even happen in Mongolia for heaven’s sake and it’s part of the modern age that we should be in”. 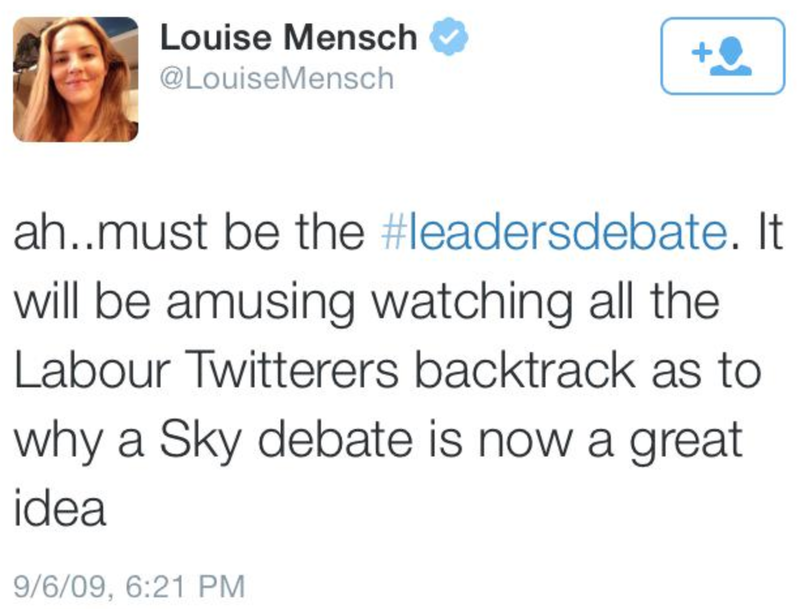 And there is another teensy problem with Ms Mensch’s current attitude to TV Debates - her own enthusiasm for them last time round, which has been preserved on Twitter. In reply to one enquiry on poll leads, she replied “if you believe fantasy leads of 26% or 2%. Last several polls all show growing Tory leads. Bookies cut odds on Tories post debate”. Debates cut odds on a Tory victory? They were clearly A Very Good Thing. They were a “must-watch”, too: “Am off to an activists' meeting. Hope I'm back in time for the leaders' debate… “ she enthused. Later there was the breathless exclamation “BREAKING: Cameron wins debate according to YouGov poll...only just....more soon”. TV Debates weren’t such a bad thing then, were they? There was no talk of Dave being in favour being some kind of mistake, was there? No sirree: “And that's why Cameron leads the party...won the debate under pressure in the only non-voodoo, weighted poll. #leadersdebate … So, front pages today all showing Cameron the winner of the second debate. Great stuff”. 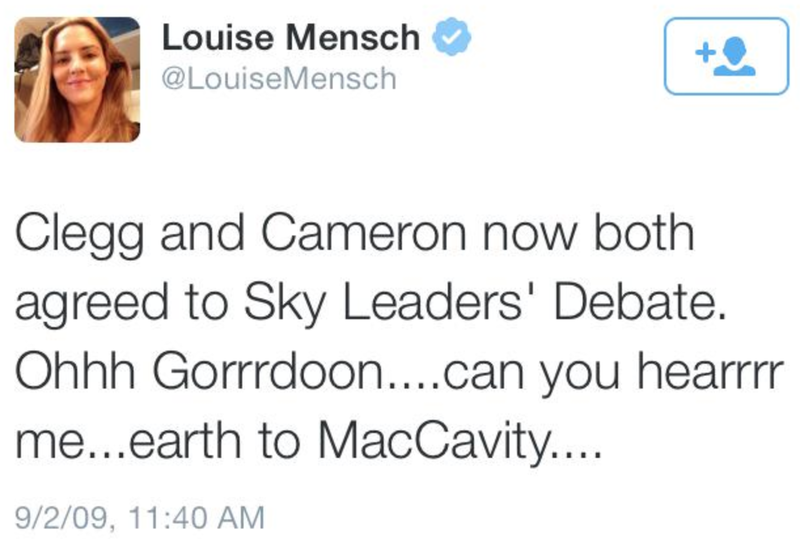 Yes, in 2010 Louise Bagshawe (as she was then) said TV Debates were “Great stuff”. Now the same person says Dave was mistaken in accepting those debates - that he had been advocating for years previously. Doesn’t that make Ms Mensch a stinking hypocrite? Yes, but no more than usual. [UPDATE 9 March 1400 hours: a Zelo Street regular has pointed out that Ms Mensch's enthusiasm for TV Debates extends back into 2009, and that there are particularly good Twitter examples of this. Take this example, from February of that year: "Clegg and Cameron now both agreed to Sky Leaders' Debate. Ohh Gorrrdoon ... can you hearrrr me ... earth to MacCavity" she sneers, ensuring a very warm reception should she ever venture north of Hadrian's Wall. She was still enthusing in June, telling "ah ... must be the #leadersdebate. It will be amusing watching all the Labour Twitterers backtrack as to why a Sky debate is now a great idea". To whom she's greatly in hock. For The Sun is not a-changin'. And The Sun is not a-changin'. I'm not sure why anyone pays any attention to anything Mensch says: she's a failed politician with a brief, unsuccessful career, who as I understand it doesn't even live in this country. The few times she's had some kind of impact have been for being publicly wrong about something. She has as much relevance and credibility to British politics as Sarah Palin. Well done Tim on the research..Mensch is so obvious in her self interested pronouncements and her com temp for the public….